As a fan of both of the goofy, strange and wonderful Bill and Ted movies, I wanted to like Bill and Ted’s Most Triumphant Return #1. And for the most part, I did. It’s got View Askew Productions veteran Brian Lynch on writing duties, who has done solid work for IDW’s Buffy the Vampire Slayer series spin-off Spike: Asylum. It’s got the art of Jerry Gaylord, who has lovingly personified other franchises like TMNT and Adventure Time. Yet while Bill and Ted were very much themselves, they also seemed to lose a little something in the translation. Bill and Ted picks up right where Bill and Ted’s Bogus Journey left off, with the titular boys from Wyld Stallyns high off their winning performance at the San Dimas High School battle of the bands. All your Bill and Ted favorites are there, Death, the Princesses and the Stations! Future nemesis De Nomolos is carted off in handcuffs, swearing revenge on the Stallyns and It’s not long before the media is clamoring to know when the pair will write their next epic single. 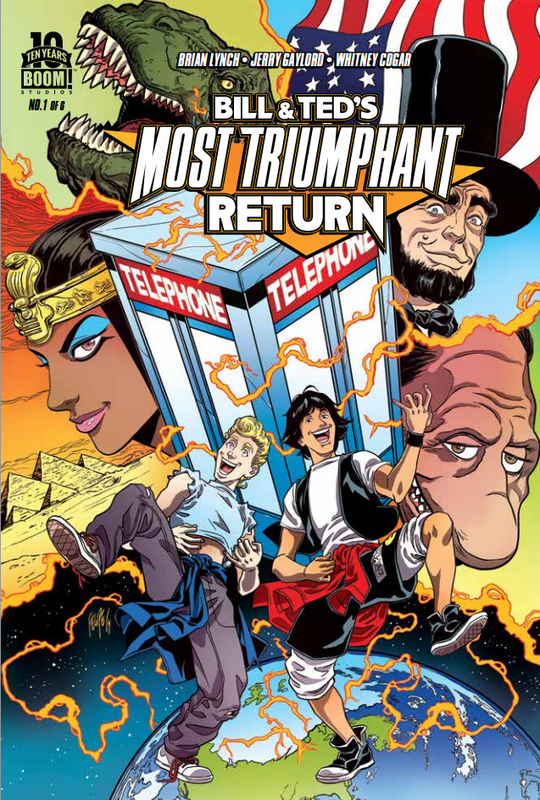 Stopping home to check in with their newborns, left in the care of the now reformed “good” robot Bill and Ted, the boys find themselves wading through a field trip from the future San Dimas High that has phone-booth time traveled into their bedroom. And we’ve only just gotten halfway through the comic. This is what left me a tad disappointed by this first issue. It felt a little more like a tour through a Bill & Ted theme park than a story in it’s own right. But this is a problem not unique to this comic, so some leeway must be given in this first issue of this comic adaption of the wildly successful, if critically mixed, Bill & Ted franchise. Still, the tour through all of the Bill and Ted characters we know and love should have moved along a bit quicker. Also missing was the somewhat dark, more adult sense of humor from the films. This book read more like a Saturday morning cartoon. Not the officially licensed Saturday Morning Bill & Ted cartoon, but a cartoon nevertheless. Still, Lynch has the voice of Bill and Ted down pat: their dialogue seems very natural and unforced, and Jerry Gaylord’s art is a marvel: the characters look so good I almost wish this book would some how be the jumping off point for another animated series. I would’ve liked more Rufus interaction right up front, and not just for sentimental, George Carlin-related reasons. More Rufus interjections could have provided some framework that could have made the Bill and Ted interactions with fans, friends and followers seem a little less aimless. This may have been avoided due similarities with Evan Dorkin’s Bill and Ted’s Excellent Comic Book series. Still, for fans of the San Dimas metalhead duo this comic will go down smooth and leave you with a smile on your face. It’s also bound to drum up buzz for that new Bill and Ted sequel that Alex Winters has been chumming the waters for since 2010. Edie is a New York-based writer, reporter, interviewer, and publicist with a passion for entertainment and geek-related media.